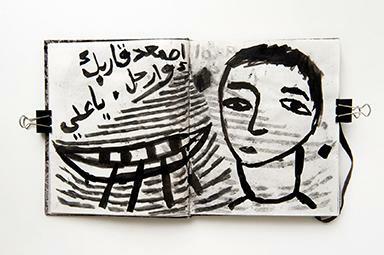 Ayyam Gallery is proud to announce the recent acquisition of Sadik Kwaish Alfraji’s ‘Ali’s Boat Diary 1’ by the British Museum. The work is currently on display alongside other works on paper by acclaimed artists Nabil Nahas, Shafiq Abboud, and Marwan. Titled From the figurative to the abstract - modern art from the Arab World, the exhibition demonstrates the aesthetic and ideological universality in the practices of this group of artists who have all studied and worked outside of their respective homelands.